I’m kinda new to this writing lark, but it is something I should have done many, many years ago. I love it, simply, I just love it. 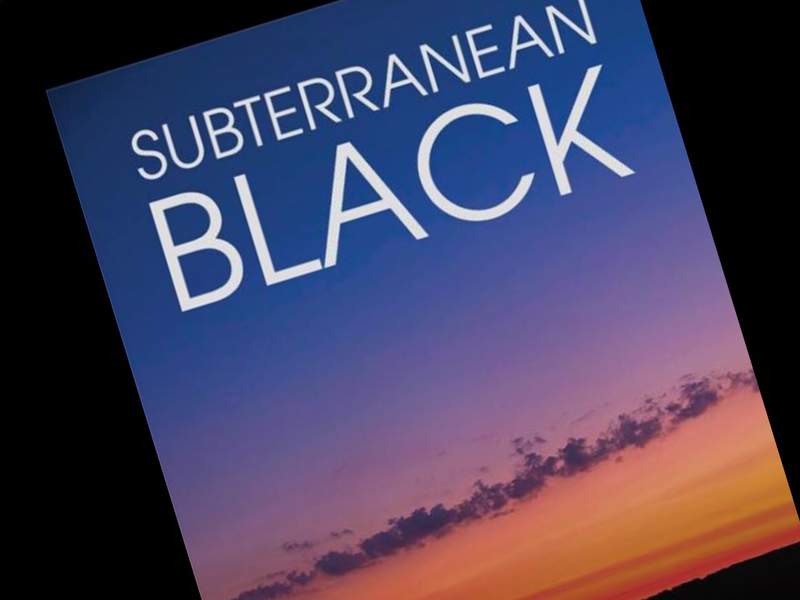 My first novel, Subterranean Black, a race against time at the edge of the death of the earth, took me two years to conceptualise and write, all 200,000 words of it. I did this between sleeping and working, that is, half an hour before I went to sleep, or when I woke up in the morning, or if I was having a restless sleep I’d often find myself at 4 o’clock in the morning starting a new chapter. A bit like now with this blog actually. With Subterranean Black, the story was easy, it came to me in a flash, in the middle of the night. The following night book 2 appeared like an epiphany, then book 3 just visualised a few days later. It is a wonderfully organic thing writing, it allows one to escape a world of worry, just for a short time, and whilst often books do that for the reader, it sure as hell does it for this writer too. Believe me, if you enjoy emersing yourself into a good book, if you get excited about the story, if you fall in love with the characters, multiply that by 100 then multiply again and you get the feeling I feel when I create something new. In Subterranean Black, it is all about the characters, it’s all about you and me and what we’d do if we got the opportunity to save ourselves when the world died. How we’d fight for ourselves and our loved ones, how we’d fret and worry and deal with the death of the earth, how we’d help our fellow man or defend our loved ones against a foe with evil intent. And actually, that’s a lot like real life. We all have a daily struggle sometimes, some more than others, we all have to dig deep, we all have to survive against the odds and it is all of those little battles, those daily toils which one has to harness in ones writing to make it believable and relatable. Above all else, that is what I love most about writing, exploring the human condition, what we all have inside of us, what we all are, what we are capable of, that and the realisation that to write a good story you just have to look at the world around us, the hatred as well as the love, the desire to destroy as well as the need to co-operate for the greater good. As an indie writer, I find myself just absorbing the minutest piece of information now, the tiniest scrap without even knowing it. With Subterranean Black I learned about Elon Musk’s Space X spacecraft, I research the best place in Britain to create a new underground nation, l learned about pure-fusion weapons and halcion engines, but I also learned more about human beings than I ever thought was possible. I want you to love the characters, the family who are desperate to save their child who they’ve poisoned to end the pain, the loner who comes good, the couple who are separated but who are desparate to find one another, the doctor taking on everyone’s burden and cracking under the strain whilst holding himself and everyone else together. I also wanted a strong female lead, another loner, a battler, someone who cares, then suddenly Miri appeared and I instantly fell in love with her, hook, line and sinker. So you see, there is love in this writing lark, there is excitement and there is passion and if only you could absorb 5% of the passion that the writer puts into their work, then the writer, I’m sure, would be happy. I am currently writing concurrently, Sesmic Wave, the sequel to Subterranean Black, set 19 years after the original book, and a new project with a totally new genre for me, The Last Breath in Williamsburg, a supernatural thriller based in 1930’s New York which I hope, I plan, will introduce a new hero to you. Both are getting me excited, both are getting me up and writing at 4am, both I am living for, both are keeping me sane in this troubled, horrible but awesome and wonderful world.